What lies behind the human urge to collect things? What is the true psychology of the kleptomaniac? These questions bear on all of us; within every person there lurks a fanatical philatelist or a monomaniacal lepidopterist, just waiting to burst forth. In his new story cycle, Twelve Collections, Zoran Zivkovic, the master of mind-bending surreal fantasy, applies his fertile mind to this problem. Some of Zivkovic’s characters are lonely eccentrics, driven to gather unusual objects by quirks of temperament or fate; others are the victims of metaphysical collectors from Beyond, entities eager to snap up memories, emotions, and other loose fragments of the soul. 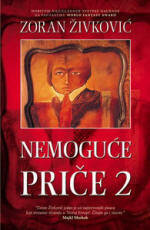 A five-part TV series, “The Collector,” produced in 2005 by the Belgrade-based Studio B Television, is based on this book. When I entered the pastry shop, a purple wave swept over me. Almost every surface was in some shade of this color: the wallpaper, curtains, rugs, tablecloths, chair covers. So were the shades on the lighted table lamps. The muted light gave even the air a purple tint. I squinted and took a look around. Not a single one of the six small round tables with three chairs each was occupied. The pastry chef was standing behind the display counter, wiping a glass with a purple napkin. His apron was inevitably of the same tone as everything else. He seemed more stocky than stout, and a thick, cropped beard and mustache compensated for his shiny bald head. He smiled and nodded, putting down the glass and napkin. “Good evening,” I replied, returning his smile, and took off my hat. I hesitated a moment, then headed for the table farthest from the door. I put my coat and hat on the coat rack in the corner and sat in the chair next to the wall. The pastry chef hastened to my table with the napkin draped over his arm, smiling all the while. “What would you like?” he asked solicitously. “You’re in the right place. We have a fine selection of pastries.” He indicated the menu in the purple cover before me on the table. I picked it up and opened it. The pages were a somewhat lighter shade of purple, while the words were written in orange. The pastry chef had not overstated the selection. The list of different pastries filled an entire eight pages. My eyes skimmed the pages, making their way down the list. The farther I went from the beginning, the less familiar were the names. What, for example, could be hiding behind “livid lightning rod”, “shambling violin” or “absent-minded bumblebee”? The “enamored water lily” brought a smile to my lips. Items on the fifth page had names that seemed intended to repel those with a sweet tooth. Indeed, who would order a “stinky grater”, “putrid acrobat” or “cheerful carcass” without being in the know? I closed the menu and put it back on the table. The smile that had seemed glued to the pastry chef’s face abruptly vanished. I couldn’t properly read the look he gave me. It seemed inquisitive and reproving at the same time. “Special?” he repeated in a voice that had lost its warmth.